US President Donald Trump welcomed the fall of the Islamic State group's five-year "caliphate", but warned that the terror group remained a threat. 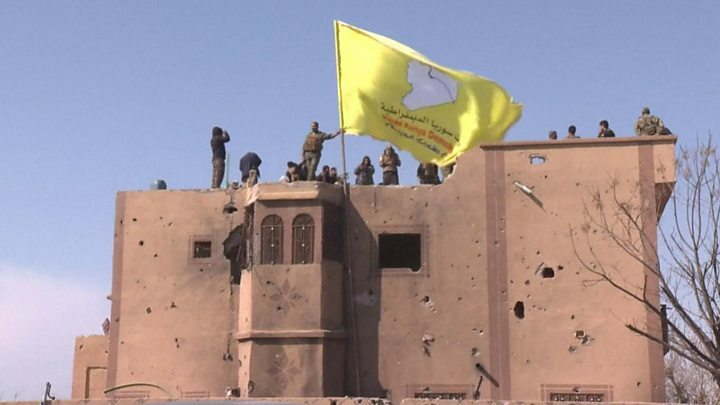 Mr Trump's remarks came after Kurdish-led Syrian Democratic Forces (SDF) raised victory flags in the Syrian town of Baghuz, IS's last stronghold. He said the US would "remain vigilant until [IS] is finally defeated". At its height, the group controlled 88,000 sq km (34,000 sq miles) across Syria and Iraq. 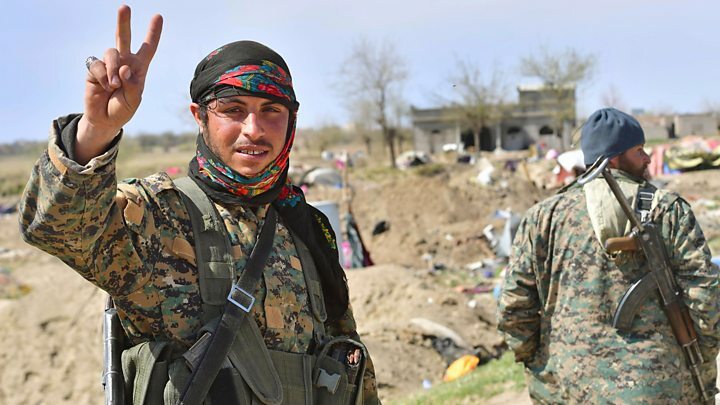 After five years of fierce battle, though, local forces backed by world powers left IS with all but a few hundred square metres near Syria's border with Iraq. 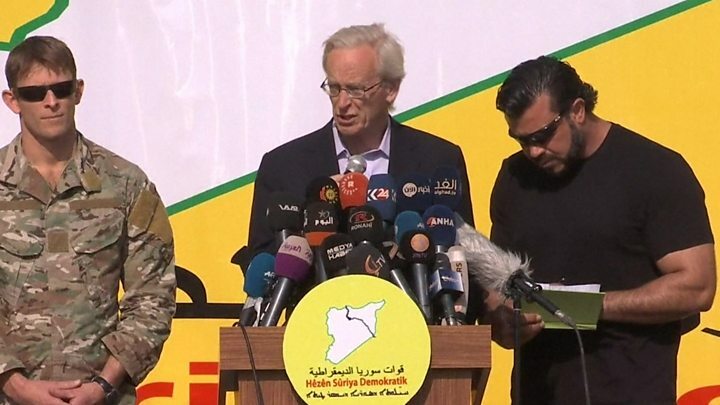 On Saturday, the long-awaited announcement came from the SDF that it had seized that last IS territory. Western leaders hailed the announcement but emphasised that IS was still a danger. "We will remain vigilant... until it is finally defeated wherever it operates," Mr Trump said in a statement. French President Emmanuel Macron said "the threat remains and the fight against terrorist groups must continue". UK Prime Minister Theresa May welcomed the "historic milestone" but said her government remained "committed to eradicating [IS's] poisonous ideology". Media captionBBC Arabic's Feras Kilani says that losing their last stronghold is unlikely to be the end of Islamic State. In a statement released by the White House on Saturday, Mr Trump said the US would "continue to work with our partners and allies... to fight [IS] until it is finally defeated." "The United States will defend American interests whenever and wherever necessary," the statement read. Mr Trump described IS's loss of territory as "evidence of its false narrative", adding: "They have lost all prestige and power." He also appealed to "all of the young people on the internet believing in [IS] propaganda", saying: "Think instead about having a great life." It joined the rebellion against Syrian President Bashar al-Assad in 2011. By 2014 it had seized swathes of land in both countries and proclaimed a "caliphate". The location of the group's overall leader, Abu Bakr al-Baghdadi, is not known. But he has avoided being captured or killed, despite having fewer places to hide.